Hi, this BeerShoptober blog is all about Drink of Fulham. Now I warn you if you plan on visiting do not rely on any maps to get you there as they will take you 5 minutes out of the way. The shop is on 349 Fulham Palace Road which is only a few minutes walk away from Hammersmith and Putney Bridge stations. This shop does not just cater for us beer lovers though. No it doesn’t sell wine or spirits it specialises in home made curry pastes. Yes while you pick from the excellent beer choices you can have your own paste made fresh right in front of your eyes. When I visited the owner Shrila Amin was away so there was no curry pastes to buy and apparently the beer levels were lower than usual. However there were still lots of beers to choose from, check out the gallery below. As you can see this shop is serious about pairing food with beer with the Siren Craft Beers linked with specific foods such as Thai or Cheesecake. They also had some great beer glasses to buy as well with my favourite being Straffe Hendrick from De Halve Maan Brewery we visited last year in Brugge. One beer which caught my eye was the Armageddon from Brewmeister which is titled ‘The World’s Strongest Beer’. If this is truly 65% then my gosh thats terrifying, but I would love to try it. They had lots of beer choices and I was assured that the beer selection changes regularly which is good to hear. I liked this shop. There were lots of interesting beer choices and I will visit again for one of their events. Drink of Fulham is always having events and tastings happening so for the latest information check out their website here . 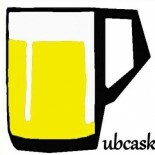 If you love beer and you have a sense of humour then pubcask is just for you! Probably a good 30 minutes from Hammersmith and 15 from Putney Bridge but it is an excellent place and well worth a visit! This entry was posted on October 25, 2013 by Jon Stone in Beer Shops and tagged Beer, Beer Shops, Curry Paste, Fulham, Hammersmith, Real Ale, World Beers.